Pregnancy is such a joyous, exciting, and often overwhelming time. There is so much to learn, so much to prepare for and so much to avoid to keep your growing baby healthy – food and beauty-wise. When I got pregnant, all of these “don’ts” were swirling around in my head: don’t eat deli meat, don’t eat sushi, don’t use retinol. The biggies I knew, but figuring out everything that could be potentially harmful to my baby took some time, online digging and talking with friends with kids to figure out. Luckily when it came to beauty ingredients to avoid, one of my girlfriends, whom had her first baby last year and is a pharmacist, was super helpful directing me in the beginning stages of my pregnancy. She began the conversation with me early on about which skincare ingredients to avoid. 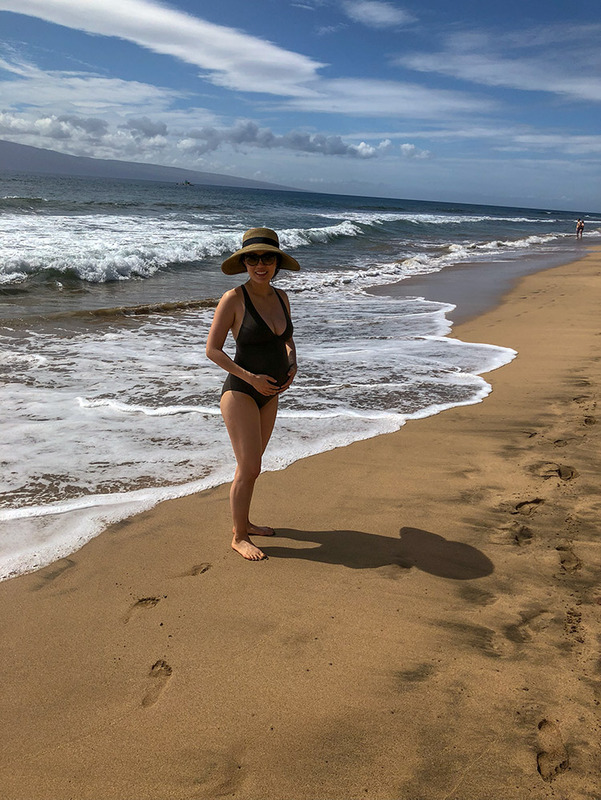 As a nontoxic beauty blogger, I was already avoiding many ingredients she flagged, like parabens, phthalates and hydroquinone, but there were a couple I didn’t realize could be potentially harmful to the fetus, like salicylic acid and chemical sunscreens. Below I’ve compiled a list of the beauty ingredients I have been steering clear of while pregnant and why. And while you may choose to do the same, remember, avoiding these ingredients or not is a personal decision between you and your healthcare provider. If you feel there are items on this list you are okay with using, that’s okay, too. Or there are others you want to also avoid that aren’t on this list, that’s fine too. No judgement! Everyone has to do what’s right for their skin and their body, and as always it is a personal decision. 1. AVOID: Retinoids (retinol, retinA, retinyl palmitate, retinaldehyde) While the amount of drug absorbed from the skin when using Vitamin A derivatives is very low, there are published case reports of birth defects associated with topical tretinoin (prescription retin A) use. Because of this the FDA has rated retinoids category C meaning “risk to the fetus” cannot be ruled out. Many products with vitamin A derivatives are easy to avoid and will be marketed as a retinoid product, but others will not. Early on in my pregnancy, I made the mistake of using the Juice Beauty Green Apple Brightening Gel Cleanser before spotting it contains retinyl palmitate. So always check ingredient labels since some products contain retinoids that don’t advertise they do! And don’t stress or freak out if you happen to use a product with a vitamin A derivative by mistake a few times. Studies have shown only .7 -7% of the product can be absorbed into the skin, so we’re talking about a relatively small amount. Just stop using the product right away and you should be fine. *ALTERNATIVES: Vitamin A in the betacarotene form found in naturally derived butters and oils, like shea butter, moringa oil, or rosehip oil are safe to use during pregnancy and can provide anti-inflammatory, antioxidant and reparative support. I have been using Eu’Genia Unscented Shea Butter to help with my dry, inflamed skin and love it! Another alternative is the True Moringa Pure Moringa Oil face oil. Both contain high amounts of oleic acid, great for dry, sensitive skin, and can be used on the face to help with pimples, acne scars, damaged skin, stretch marks, age spots and fine lines. 2. AVOID: Salicylic Acid. In its oral form (aspirin), salicylic acid has been shown to increase the risk of intracranial bleeding and animal studies have shown embryo malformations when given high quantities, which is why doctors tell pregnant women to avoid aspirin while pregnant. It is categorized by the FDA as a category C drug when taken orally during pregnancy. But there are no studies of topical salicylic acid use by humans during pregnancy. The American College of Obstetrics and Gynecologists say that topical salicylic acid is pregnancy-safe when restricted to local areas for limited durations, but personally, I have chosen for myself to avoid this ingredient in skincare products UNLESS it is (a) included in a product in the form of willow bark extract, and (b) in a wash off product, like a face cleanser, since the product is on the skin for a shorter period of time. *ALTERNATIVES: I have been using during my pregnancy the Dr. Jart Dermaclear Micellar Water which contains a very small amount of willow bark extract. The Graydon Face Foam Cleanser is another cleanser I really like but is much stronger since it contains willow bark extract and apple cider vinegar (natural AHA). 3. AVOID: Parabens (isopropylparaben, isobutylparaben, phenylparaben, benzyleparaben, pentylparaben, methylparaben) Parabens are used in beauty products as a preservative; they extend the shelf life of products. When it comes to pregnancy, studies have reported parabens are capable of crossing the placenta, infiltrating breast milk, and disrupting the growth of male fetuses. But IMO parabens should be avoided whether you’re pregnant or not since they can easily absorb into your blood stream through the skin and have been found to have harmful endocrine disrupting capabilities, and a propensity to disrupt the skin’s microbiome leading to dermatitis, acne and rosacea. *ALTERNATIVES: By sticking to nontoxic and green beauty products, you’ll easily avoid parabens. Most green beauty products use fermented radish root or essential oils as their preservatives, or are completely water-free products, like face oils, which don’t require a preservative at all. Great options for nontoxic beauty products can be found at detoxmarket.com, credobeauty.com, petitvour.com and health foods markets. 4. AVOID: Chemical Sunscreens (dioxybenzone, oxybenzone) There has been a lot of talk about oxybenzone the past few years as more and more studies have come out linking the chemical sunscreen to hormone disruption, allergies, and its ability to easily absorb into the blood stream. It is advised pregnant or not, consumers should avoid this chemical. Be sure to read the ingredient labels because many drugstore brand SPFs, like Banana Boat and Aveeno, still use it (see full list of brands containing oxybenzone). Of the chemical sunscreen ingredients, avobenzone is the “best” but I personally try to opt for physical sunscreens that contain zinc oxide or titanium dioxide, since they’re more stable and provide longer UV protection. *ALTERNATIVES: Zinc oxide is my preferred sunscreen ingredient. It’s a physical blocker that provides excellent UVA protection , allows less than 1% to penetrate the skin and there are no inhalation or endocrine disrupting concerns. If you are looking for a tinted SPF with zinc oxide, I love the Marie Veronique Everyday Tinted SPF 30; it offers sheer to medium coverage and a matte finish. I know a lot of people are crazy about the Suntegrity 5 in 1 Sunscreen , which I do think is a fabulous product – super smooth texture, pore refining, plumping, hydrating and great coverage – but it contains dimethicone (silicone) which can be an issue for those with acne. Sometimes I find products with silicone cause me to get tiny clogged bumps all over my face by the end of the day. Yet, I’ve spoken with other bloggers who don’t have any issues with it, so it’s more personal preference. If you want a non-tinted SPF for face, I highly recommend Luzern La Defense SPF 30 Urban Protect . It contains antioxidants proven to prevent sun damage, vitamin B5 and hyaluronic acid to hydrate skin, and organic licorice to brighten skin tone. And when I don’t feel like putting SPF on at all but need to go outside to take my dog for a short walk, I’ll wear my Coolibar hat which has built in UPF capable of blocking 98% of UVA/UVB rays. *Coolibar was the first clothing brand to be recommended by the Skin Cancer Foundation. 5. AVOID: Self Tanners containing (dihydroxyacetone) According to the American Pregnancy Organization, dihydroxyacetone, commonly found in self-tanners, is able to penetrate the skin getting into the blood stream and potentially cross the placenta. More research is needed, to understand if spray tans (at-home or professional) when inhaled or absorbed could cause potential birth defects so most of the online literature I found recommends steering clear of self-tanners while pregnant. Thankfully, for me this isn’t a big deal. I haven’t used a self-tanner since, um, 1999? But I was surprised when I went to finally use a self-tanner recently that the nontoxic, green brand I reached for contained dihydroxyacetone!? Both nontoxic brands, Suntegrity and Eco-Tan, contain dihydroxyacetone. Though, the dihydroxyacetone in both is “eco-certified” and from a natural source, I’ve decided to still avoid them. 6. AVOID: Toxic nail polish (formaldehyde, toluene, methylbenzene, antisal 1a) Since studies have found both formaldehyde and toluene to be proven carcinogens and cause reproductive and fetal development toxicity in animal studies, almost all nail polish brands have removed these chemicals from their formulations including drugstore favorites Essie and Sally Hansen. But if you want to go a step further and avoid endocrine disrupting phthalates, camphor, ethyl tosylamide, xylene and parabens, ingredients many drugstore brands have yet to remove, try the cleaner nail polish alternatives below. *ALTERNATIVES: I very rarely wear nail polish, but when I do, I love Tenoverten polishes! Their colors are fashion forward and very sophisticated. They also have nail spas in NYC, LA and Austin that are pregnancy safe (they don’t offer acrylics or gels, meaning no chemical dust in the air or harmful UV lights). But if you like bolder colors, try the nail polishes from 7TRUE. They have daring greens and oranges, and I love the long wearability of their polishes. 7. AVOID: Hydroquinone (tocopheryl acetate, 1,4-dihydroxybenzene) Hydroquinone is commonly included in over the counter and prescription topical as a skin bleaching agent. There are very limited studies on pregnant women determining the effects of hydroquinone on pregnancy (since I assume most pregnant women don’t want to be part of such clinical trials…), but due to hydroquinone’s high absorption rate and animal studies reporting carcinogenic effects in rats, it’s recommended pregnant and nursing women avoid using this chemical. *ALTERNATIVES: If you’re looking for something to lighten pigmentation, there are so many wonderful nontoxic options available! Vitamin C serums are usually what people reach for to lighten sun spots and are great options, but products with licorice root (inhibits melanin production and reduces pigment) and fruit enzymes (exfoliates and provides antioxidant support), like the Juice Beauty Green Apple Brightening Essence (the one item in this line that does not contain Vitamin A derivatives) also work really well. The You Skincare 20% Vitamin C Antioxidant Serum is one of my favorite vitamin C serums because of its more alkaline pH, meaning sensitive skin types can tolerate this serum. Many L-ascorbic acid vitamin C serums have a low pH (acidic) which can cause sensitization. 8. AVOID: Fragrances (phthalates) When I first learned about the toxic nature of traditional synthetic fragrances during my interview with Anne Nelson Sander, the founder of nontoxic fragrance brand, LURK Beauty, I was shocked! At that point, I was transitioning to completely green skincare, but still holding on to my favorite synthetic fragrances. After our interview, they all went into the trash. Yup. Most synthetic fragrances on the market use chemical fixatives such as phthalates to make scents adhere, lift and linger in the air. Phthalates unfortunately have been found in studies to disrupt hormones, contribute to infertility and inhibit fetal development, which is why pregnant and nursing women are advised to avoid synthetic fragrances. While the simple answer may be to just avoid fragrances with phthalates, it’s not so simple. Due to the proprietary nature of fragrance blends, the FDA does not require fragrance companies to reveal their ingredients leaving consumers in the dark when it comes to what’s in their perfume. I personally stopped using traditional synthetic fragrances after my interview with Anne almost two years ago. At first, I thought it would be a struggle to find new perfume favorites, but it ended up being rather easy. There are quite a few sophisticated nontoxic perfume options on the market now. *ALTERNATIVES: LURK Beauty’s TRN V4 oil perfume is one of my favorites. It has notes of tobacco and lavender that when combined creates an earthy sweetness with a hint of cool sophistication. *TIP: Apply this oil fragrances before dressing. I once made the mistake of applying it while I was fully clothed and ended up getting a few oil drops on my blouse. My other favorite nontoxic perfumes are made by In Fiore. They have a full line of solid perfumes that are GORGEOUS. The Night Queen is perhaps my favorite right now, but Rose Noir comes in close second. Read my full review of the In FIore solid perfumes here. *But remember avoiding these ingredients or not is a personal decision. If you feel there are items on this list you are okay with using, that’s okay, too! No judgement. Everyone has to do what’s right for their skin and their body.